Many factors influence coffee from the cherry to your morning cup. The green bean coffee processing method chosen is one of the most influential factors. This process takes the coffee cherry and turns it into dried green coffee beans. Traditionally, two methods of processing were used; washed or natural. Recently, a newer approach called honey, has also become a popular processing method. The washed processing method results in consistent quality, hence it is a popular method among coffee producers. 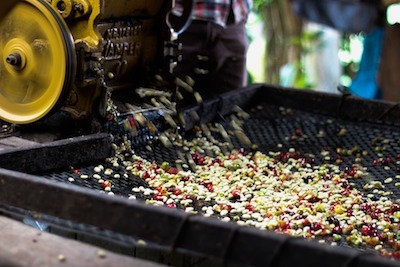 Once farmers harvest coffee cherries, they are sorted by a machine that separates ripe from unripened fruit. Using forceful water the machine takes the skin and some pulp from the beans. From this point, two approaches remove the remaining pulp from the coffee beans. The beans ferment in water and enzymes to help break down the pulp surrounding the bean. This is called the fermentation process which can last up to 36 hours. Another way to de-pulp the beans is through mechanical demucilage. This process just uses a machine with forceful water that breaks apart the remaining pulp around the bean. After the beans are free from pulp they dry in the sun on raised beds or large patios. Workers must dry the beans to a ten percent water content for them to be stable enough for roasting. Using the washed processing method is a form of quality assurance. It creates less ability for unripe or bad fruit to process. Beans processed through the washed method rely on absorbing enough nutrients and sugars during the growing season. This makes the climate, soil and fermentation processes extremely important to the flavor of the finished product. To focus on brighter flavors and single origin profiles, the washed processing method is the best option. The natural processing method is the original way coffee from Ethiopia was processed in the beginning of coffee cultivation. After harvesting, farmers sort out unripe or rotten beans along with soil and leaves. The cherries then sit out to dry in the sun. Farmhands turn and rake the beans occasionally to ensure even drying. This is extremely important to avoid fungi and bacteria growth from mildew. 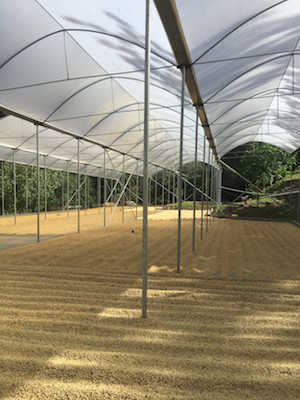 The drying process may take anywhere up to 4 weeks depending on the climate of the region. Within the natural process this step is extremely important. Beans can dry for too long, making them break apart and defective. On the other hand, too much moisture can promote bacteria growth. After drying, beans sit in silos until they are ready for the hulling process. Hulling removes the outer dried shell of the coffee cherry. Many countries cannot utilize the natural processing method. This is because their wet, tropical climates make it too humid for the beans to dry out properly. For this reason, the natural processing method can produce a lower quality bean due to the unpredictability. However, when done properly, the dry method creates flavor profiles with heavy, sweet body and complex notes. The honeyed processing method combines techniques from both the wet and natural processing methods. Farmers harvest and mechanically separate the cherry from the bean. Processors then store the beans with pulp still remaining for up to a day. With the honeyed green bean coffee processing method bacteria can be a huge problem. Therefore, when set out to dry the beans must be raked every 2-3 hours to prevent growth. Because this process is a mix of wet and dry, flavor profiles associated with both methods can be present in the finished product. Honey processed beans tend to be sweeter with mild, but preferable acidity. Each different green bean coffee processing method creates a favorable outcome. 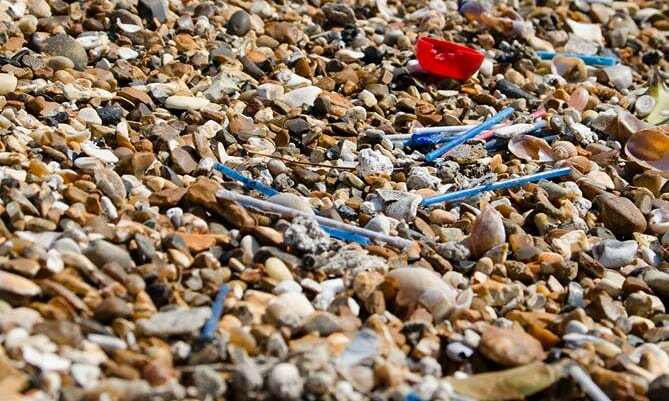 However, some methods are more environmentally friendly than others. The natural or dry processing method is the most eco-friendly due to fewer resources used in the process. Achilles Coffee Roasters own single origin Windansea roast from Ethiopia is processed using the natural method. Although, the natural process requires more physical labor to tend to the beans manually. Honey processed coffee beans also use less water than the traditional wet washed method. Various factors influence the flavor of the coffee including climate, region and soil. This is why it is important to understand the flavor profile you are looking for when choosing a processing method.